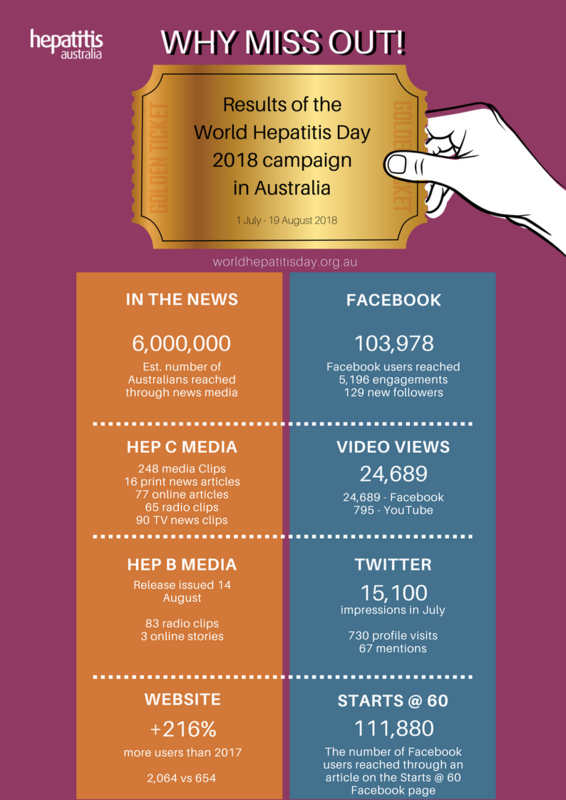 In 2018 the WHY MISS OUT World Hepatitis Day campaign generated a high level of media coverage with an extensive reach into the Australian population. The national campaign was implemented across social media as well as mainstream media outlets. Media coverage was achieve across three waves. A media release about declining access to the new cure for hepatitis C was issued on 24 July, ahead of World Hepatitis Day. This was followed up by further coverage on World Hepatitis Day. A focus on hepatitis B was held over to seperate the issues and aligned with the Australasian Viral Hepatitis Conference . The social media campaign focused predominantly on Facebook with high levels of reach attained. The social media campaign was escelated from 2 July and peaking in line with the media releases and World Hepatitis Day. Personal stories from people with lived experience were very important to the success of the media campaign. This was no more evident that with the personal story shared via the 'Starts at 60' Facebook page.